Come join us this Wednesday, October 26th for Osler Day 2016! The Pam and Rolando Del Maestro William Osler Medical Students Essay Contest has selected three finalists who will each have the opportunity to present before the judges panel from 11:30-1:00pm in the Jonathan C. Meakins Auditorium, McIntyre Medical Building 5th Floor, 3655 Promenade Sir William Osler. Faculty, students, and friends are all welcome to attend and show their support for this year’s finalists. More details about the contest can be found here. Our special thanks to the Medical Students’ Osler Society, the Board of Curators of the Osler Library of the History of Medicine, and Pam and Rolando Del Maestro for their continued dedication with this celebrated annual event. 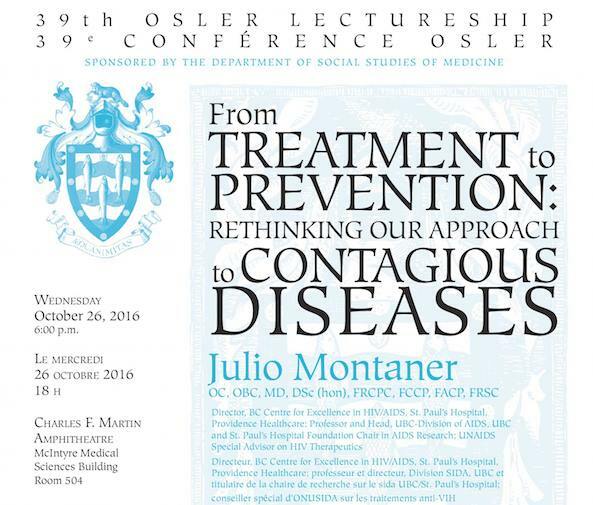 In the evening, at 6:00pm in the Charles F. Martin Amphitheatre, the 39th Annual Osler Lectureship welcomes distinguished guest lecturer Dr. Julio SG Montaner, OC, OBC, MD, DSc (hon), FRCPC, FCCP, FACP, FRSC. 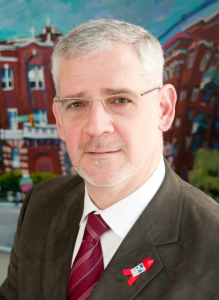 Director, BC Centre for Excellence in HIV/AIDS, St. Paul’s Hospital, Providence Healthcare; Professor and Head, UBC-Division of AIDS, UBC and St. Paul’s Hospital Foundation Chair in AIDS Research; UNAIDS Special Advisor on HIV Therapeutics. Dr. Montaner played a key role in establishing the efficacy of Highly Active Antiretroviral Therapy (HAART) and since then has established the role of ‘Treatment as Prevention’ using HAART to simultaneously decrease progression to AIDS and death, as well as HIV transmission. 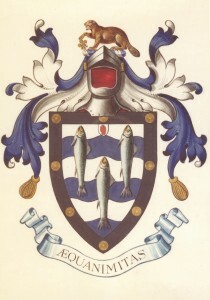 In 1996, medical researchers in British Columbia discovered that combination antiretroviral therapy (cART) significantly improved the quality and length of the lives of patients with HIV/AIDS, but only after the province began providing cART for free did researchers discover something equally profound: cART also prevented HIV transmission. This talk examines the journey from treatment to prevention and the implications for how we fight contagious diseases at local and global levels. Pam and Rolando Del Maestro with Steph A. Pang (holding medal), Zhuyin Xu, and Christian Dabrowski. Photo: Owen Egan. 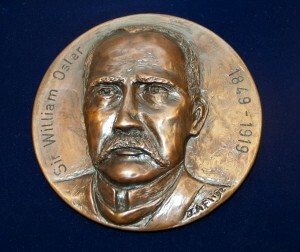 We are happy to announce that the winning essays from this year’s Pam and Rolando Del Maestro William Osler Medical Students Essay Awards are now available on our website, along with reflective pieces written by the students on their research experience. 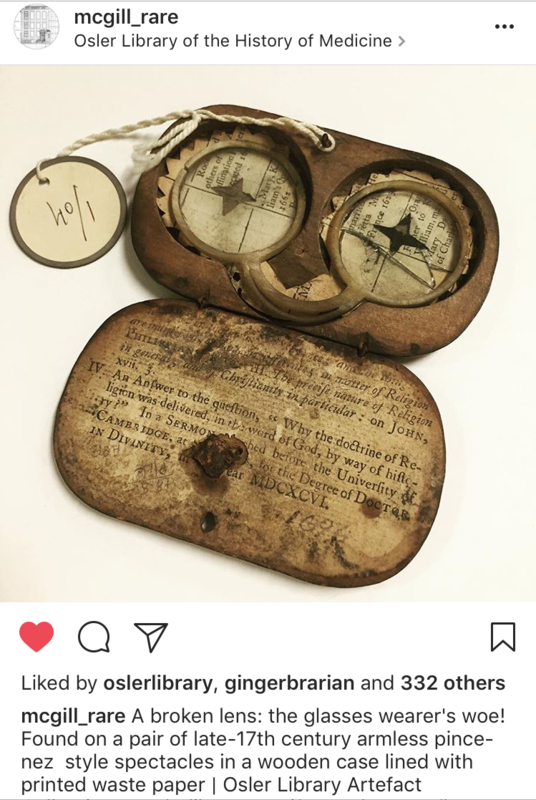 First place went to Steph A. Pang for her essay entitled, “Man and his Health Pavilion: An Architectural Reinterpretation of the Patient-Doctor Relationship.” She was mentored by Prof. Annmarie Adams of the McGill School of Architecture and the Osler’s Library’s Board of Curators. 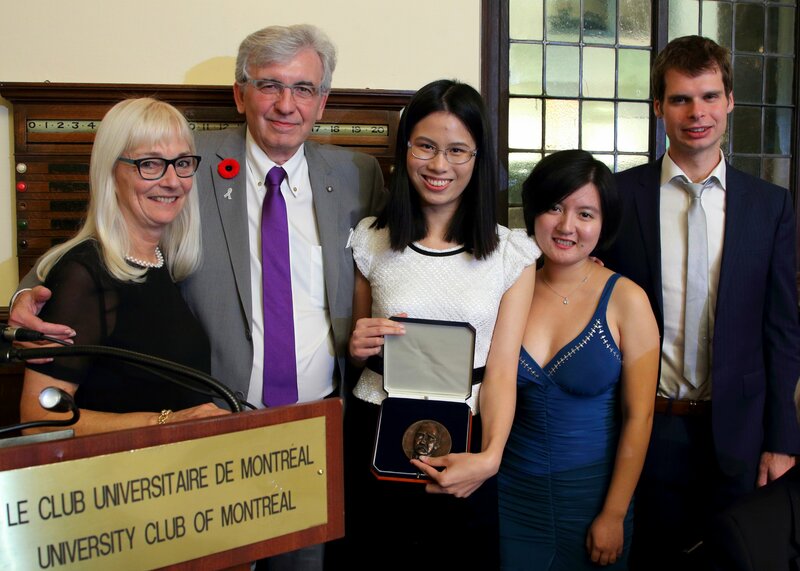 She was presented with the Osler Library Board of Curators’ Medal during the Osler Banquet hosted by the McGill Osler Society on November 4. Second place was awarded to Zhuyin Xu for her essay, “Diffusion of Medical Innovations: Minimally Invasive Surgery in China,” written under the mentorship of Prof. Thomas Schlich of the Department of Social Studies of Medicine. Third place went to Christian Dabrowski for his essay, “Between Commitment and Contentment: the Story of Norman Bethune in Montreal.” He was mentored by Dr. Nicholas Whitfield of the Department of Social Studies of Medicine. 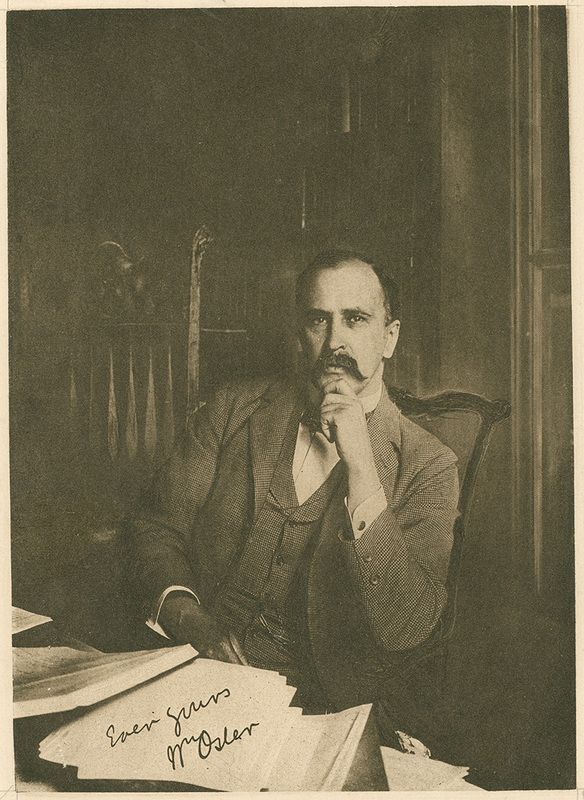 The Pam and Rolando William Osler Medical Students Essay Contest gives undergraduate medical students the opportunity to explore any theme of interest to them in the history, social studies, sociology, ethics, and humanities of the health sciences. It also provides them with the chance to be mentored by an expert in their topic drawn from the Library’s Board of Curators or elsewhere to complete their project, and to use the rich resources of the Osler Library and other libraries at McGill.To find out more about the contest, please visit our informational page. 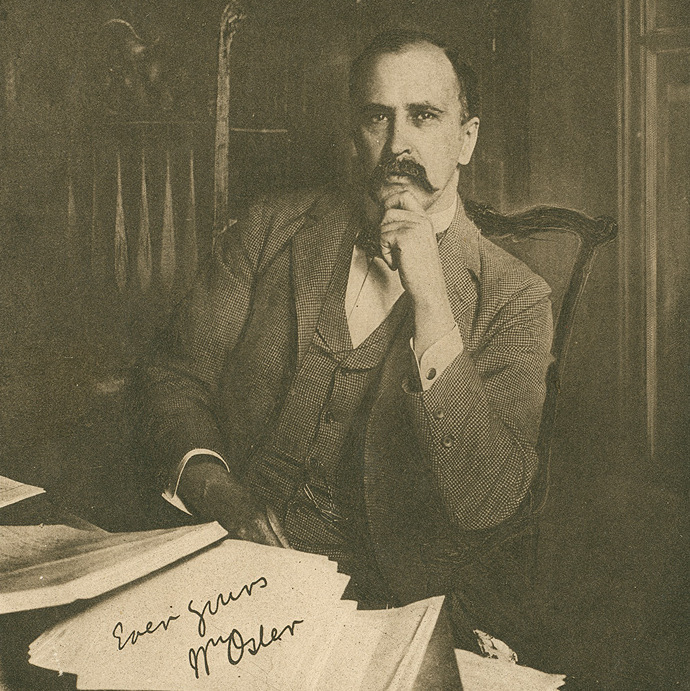 Join us on Osler Day! Please join the library on this year’s Osler Day, Wednesday, November 4th, for a presentation of essays by the three finalists chosen as part of the Pam and Rolando Del Maestro William Osler Medical Students Essay Awards. The presentations will be held at 11:30 in the McIntyre Medical Building, room 1034. 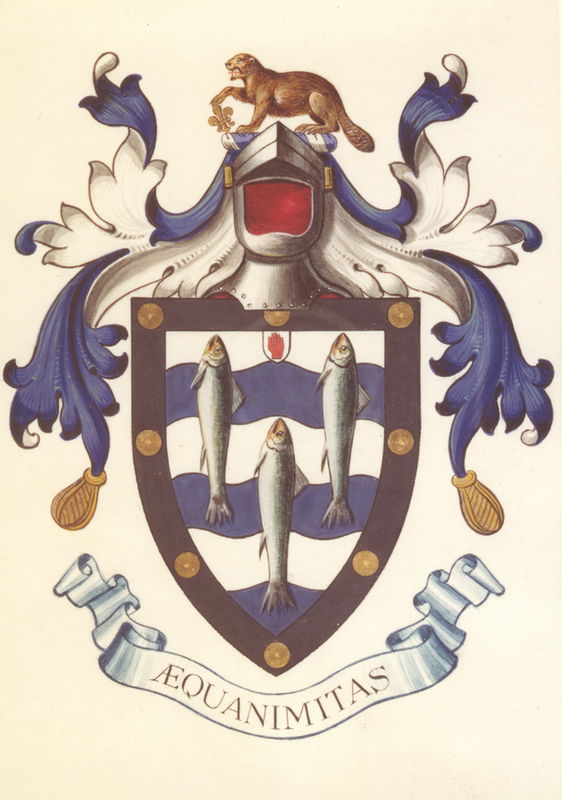 The three winning essays from the 2014 round of the Osler Society and Osler Library Board of Curators Essay Contest have now been made available on our website. There was a tie for first place this year between Julian Z. Xue and Gabriel Devlin. In the essay “On Sir William Osler’s Relationship with Death,” Julian Xue (MDCM 2014) examines Osler’s personal experience of loss and argues that these encounters with death moulded his views both philosophically and practically. Gabriel Devlin (MDCM 2017) contrasts the patient-doctor relationship in North American and Southern Europe, finding that while medical paternalism was tempered in North America in the mid-20th century due to public scandals involving medical experimentation and the anti-paternalism of equal rights movements, it continues to shape doctor-patient interactions around the Mediterranean. Third place in the contest was awarded to David Benrimoh for his essay “The Zeroth Law of Medicine,” which investigates the role of physicians and the American Medical Association as an largely oppositional force in the move towards universal health care coverage in the United States. Congratulations to the winners! 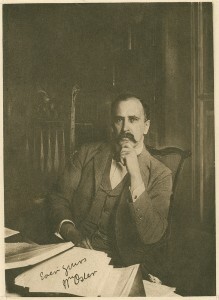 The Osler Society and Osler Library Board of Curators Essay Contest was founded in 2013 to promote student research in the history, social studies, sociology, ethics, and humanities of the health sciences. Participants select a topic and are then mentored by an expert drawn from the Osler Library’s Board of Curators or elsewhere to complete their project, drawing on the rich resources of the library. 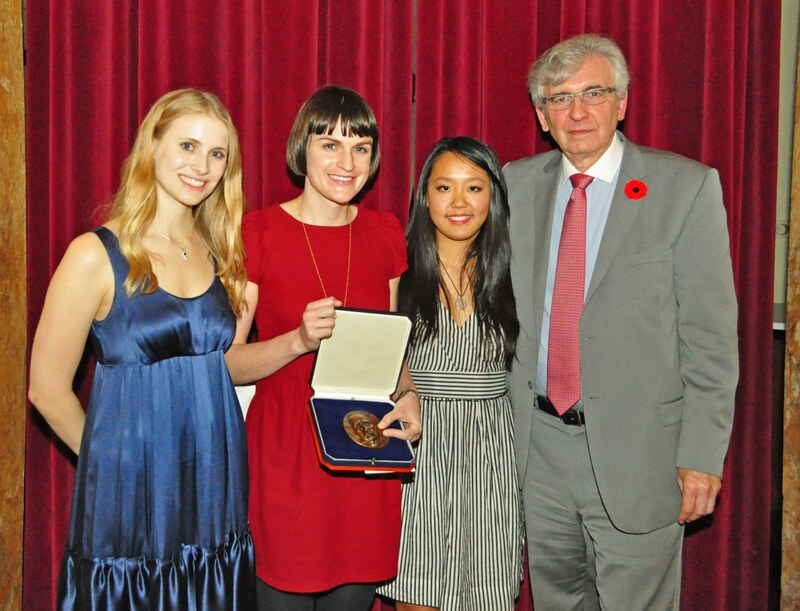 The three top finalists present their essays on Osler Day in November. Prizes are awarded t of $250 for third place, $500 for second place, and $1,000 for the winning essay. 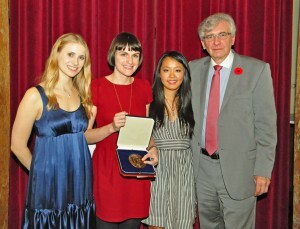 The first-place winner is also awarded the Osler Library Board of Curators’ medal. Interested in participating in this year’s contest? We are currently accepting proposals, due May 1st. Find more details here.